In 1930 Sir Otto Niemeyer, a high official of the Bank of England (the equivalent of New Zealand's Reserve Bank), visited Australia to discuss the financial crisis afflicting the country at the time. The New Zealand government asked him to advise on exchange rate policy while he was in the southern hemisphere. He recommended the establishment of a central, or reserve, bank in New Zealand. 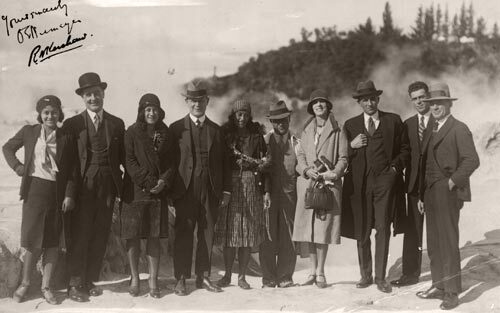 This is Sir Otto (fourth from left) during a visit to Rotorua in 1930. Other notable figures in the party include Rangatīara Ratema, best known as Guide Rangi (to the right of Sir Otto), Ngāti Pikiao leader Tai Mitchell and Public Service Commissioner Paul Verschaffelt (far right).